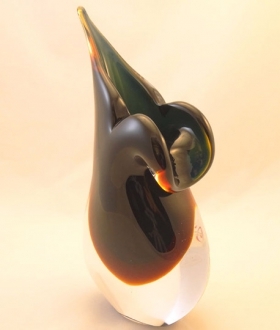 Lucio Bubacco is the son of Murano in all its senses. 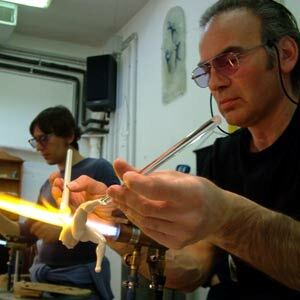 He was born in 1957 in Murano as the son of a proficient glass blower. 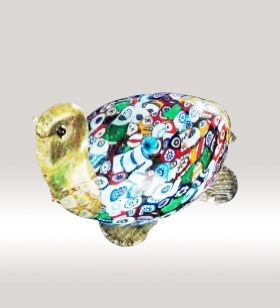 This means that he was involved in murano glass works almost from birth. He travelled extensively with his father and every journey was a expedition through the superior glass art of the world as well as that of Murano. He started his glass works as a boy with another old glass blower. Playing with glass, he began to craft small articles like animals. But his work was always inspired by the anatomy of his subject. At the age of 14 he completed a work using the ‘Lume’ technique. The uniqueness of his work was that he was inspired by some of the old world artistic ideas from the Greek, Byzantine arts. He was greatly influenced by the renaissance art also. But whatever he made exhibited an unparalleled anatomic excellence. Human body held his fascination beyond measure. Together with it, he was influenced by the fantastic world presented by the Hellenic civilization and other civilizations before Christ. As a result, his creations contained an abundance of fantastic beings, angels, devils and gods. He started his art by creating lamp holders and other blown articles like vessels and vases. But unlike the lamp art of murano that existed till that time, these objects were not so simple. With a posse of miniature human beings and other mythic and mythological creatures, they became mini installations that presented scenes and ideas in a surrealistic light that held the viewers’ interest. Each of the miniature figures was a masterpiece in itself. As the anatomy of human body allured him immeasurably, he decided to hone his expertise under the famous artist Alessandro Rossi. From then on not only its anatomy but also the movement of human body began to take an important place in his art. 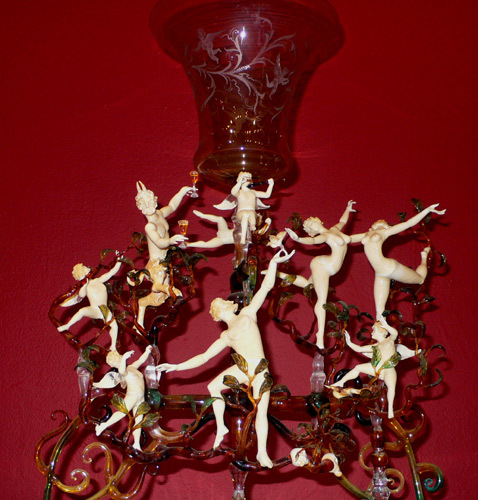 The various poses struck by these miniature glass images in his elaborate work held the world spellbound. 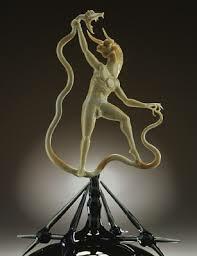 Bubacco was highly dexterous in creating movement in glass. The coloring and texturing of glass was almost inborn in him by virtue of his birth as well as growing up in a glass artist’s family. So he experimented with glass adding more of sodium to form something called ‘soft glass’. It had a special luminosity that suited his lamp works. But by this time, the old Muranese lamp art has been transformed into something that went beyond just a lighting equipment, in the hands of Lucio Bubacco. Now his art pieces occupy all the important galleries and museums all over the world. 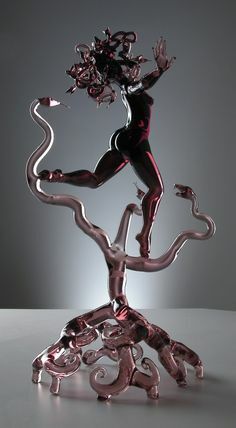 What’s more, Lucio B ubacco has started an altogether different style of glass sculpture. He also encourages other artists to use his work as templates to their own work, incorporating them into their own individual styles. Thus a new school of glass art has been brought about by Lucio Bubacco. However, his works, even if convey contemporary ideas, the figures are not contemporary. They have an antique quality because they are formed flowing the traditional styles, but following his own thoughts and ideas. Unlike the asymmetry that characterizes the modern artistic creations, Bubacco’s figures exhibit perfect symmetry and balance in their frozen movements. Lucio Bubacco’s works display a happy blend of Greek splendor and Venetian architecture. 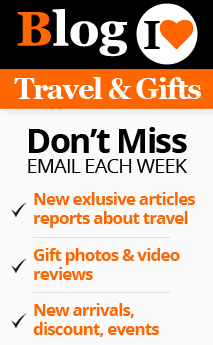 His world famous work called ‘Eternal temptations” is an example of this. It was inspired by a plethora of cultures like Greek, Christian, Judaic and renaissance art. 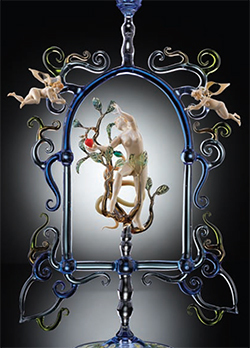 In short, Lucio Bubacco glass art has bestowed the Murano glass art with a new dimension.